Xinqiao Jia, left, and a team of researchers at UD have developed polymeric nanoparticles that are currently being evaluated as nanocarriers for anticancer drugs. 3:07 p.m., March 21, 2011----Research in the areas of drug delivery and tissue engineering has witnessed tremendous progress in recent years due to its unlimited potential to improve human health. Smart biomaterials with nanoscale organizations, defined biological functions and robust mechanical properties have the potential to enhance cancer treatment and improve tissue regeneration. Xinqiao Jia, assistant professor in the University of Delaware's Department of Materials Science and Engineering and the Department of Biological Sciences, is developing intelligent biomaterials that closely mimic the molecular composition, biological function, mechanical responsiveness and nanoscale organization of the natural matrices surrounding the cells. This biomimetic approach allows Jia to construct a three-dimensional microenvironment that will improve the understanding of cell biology and aid in the engineering of intelligent nanoparticles for targeted delivery and controlled release of cancer therapeutics. “Combining cell biology and engineering principles, we are actively developing methodologies for the engineering of healthy replacement tissues such as cartilage and vocal folds, as well as pathological tissues such as tumor tissues,” Jia explained. The polymeric nanoparticles her group has developed are being evaluated as nanocarriers for anticancer drugs. The ultimate goal is to enhance the efficacy of the drugs while minimizing their debilitating side effects. For her novel approach, Jia will receive the Academic Research Award at the Delaware BioScience Association's (Delaware Bio) 2011 Annual Awards Gala on April 11, to be held in Wilmington, Del. The award recognizes significant contributions to the advancement of life science research at an academic or medical research institution in Delaware. A previous recipient of the National Science Foundation's Faculty Early Career Development Award, Jia was nominated by fellow faculty member S. Ismat Shah. “Professor Jia is one of our brightest young faculty members. Her research is being recognized nationally and internationally with coverage of her work appearing not only in high impact journals, but also in popular magazines,” said Shah, professor in the Department of Materials Science and Engineering and in the Department of Physics and Astronomy. Jia is a 2010 recipient of the DuPont Young Professor Award and was named an Outstanding Junior Faculty in UD's College of Engineering the same year. She received her bachelor's degree in applied chemistry and master's degree in polymer chemistry and physics from Fudan University in Shanghai. 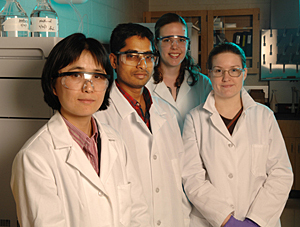 Jia earned her doctoral degree in polymer science and engineering from the University of Massachusetts at Amherst. Prior to joining UD in 2005, she conducted postdoctoral research with Robert Langer, a pioneer in drug delivery and tissue engineering at the Massachusetts Institute of Technology. Delaware Bio is a non-profit trade association that serves its members and the state of Delaware by collaborating with other local businesses and organizations to advance the growth of the bioscience industry in Delaware and the region.